I have been so busy recently I can hardly find any time to have a breather. If you’ve been following my blog and Twitter, you will know that working on my cookbook has pretty much consumed all my time. As a result, I have been eating out more, and cook only when time permits. 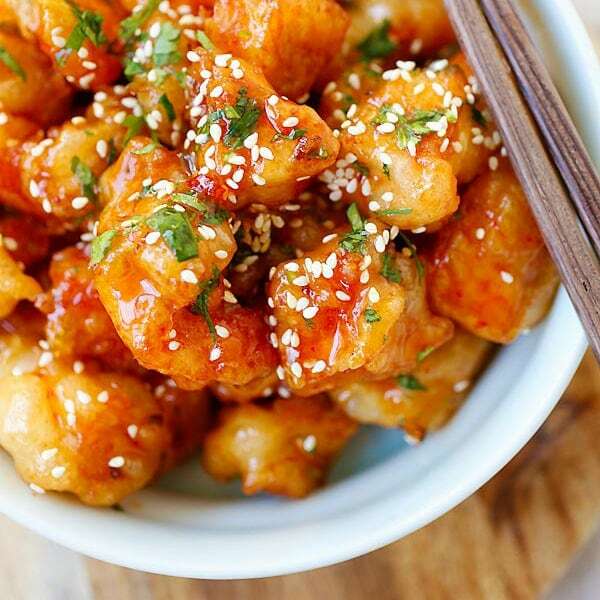 In the past, I would always attempt to make my Asian dishes from scratch. If that means tedious work and hours of making my own spice paste, I would do it. But I can no longer afford the time. As a result, instant spice paste and seasonings have become my easy and go-to ingredients nowadays. I absolutely love them, especially the World Foods line of instant paste, condiments, and sauces, which I bought from my neighborhood Whole Foods market. For my lunch today, I made Mie Goreng, or Indonesian fried noodles, using World Foods Indonesian Fried Rice Paste. It was delicious and so easy to make. Most importantly, it satisfies every ounce of my craving for this noodle dish, and totally reminded me of my holidays in Bali when every lunch, the hotel butler would bring a serving of this flavorful noodles to me! 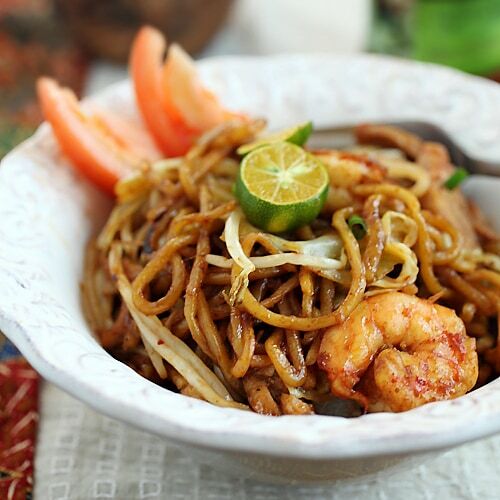 Here is my mie goreng (Indonesian Fried Noodles) recipe. Please take note that this is a very simple version of this iconic Indonesian dish. It fits my busy schedules and doesn’t compromise on the taste. You can also use the same paste to make nasi goreng, or fried rice. Heat the oil in a wok or skillet over high heat. Add the minced garlic and stir-fry until aromatic, then add the chicken and shrimp. Stir continuously until they are half cooked. 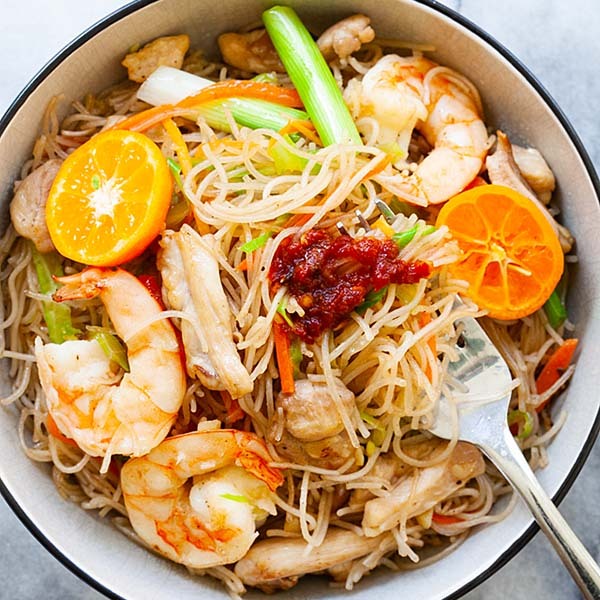 Add the cabbage, bean sprouts, and noodles into the wok or skillet and stir fry for about 10 seconds before adding the World Foods Nasi Goreng Paste, kecap manis, and salt. Using the spatula to toss the noodles and all the ingredients back and forth until well combined, about 1 minute or until the noodles are cooked through. Dish out, garnish with chopped scallion and a couple of tomato wedges. Serve immediately. World Foods is a Malaysian brand, with its manufacturing facility in Thailand. It offers a range of Asian-flavored sauces and pastes for everyday cooking. The products are available worldwide. In the United States, you can find them at Whole Foods markets and other outlets, or online. I go to WHF quite often. I may try to get this :) Thanks ah! Tiga – check the website and see which Whole Foods has the products in California. Thanks for recommending this instant paste. I always cheat with instant paste or sauce, who has time to make everything from scratch all the time? I agree. Life is too short and hectic to always get stuck in the kitchen. Hehe. I so agree with you Bee that sometimes lack of time makes cooking from scratch impossible esp. during weeknights. There’s nothing wrong with using ready made pastes or sauces if they are good quality. So convenient. I LOVE mie goreng and yours looks every bit ‘authentic’. 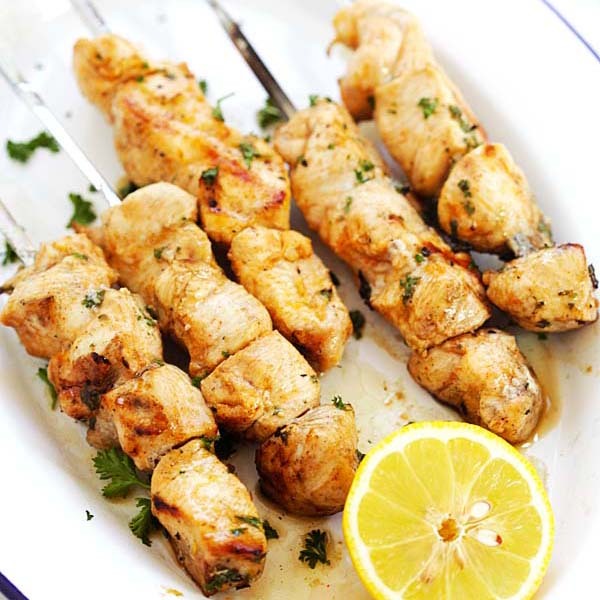 Eleanor – correct, life is too short and busy sometimes to make everything from scratch. That’s why I love great instant paste such as this. I must say that their products are all safe with no MSG and chemicals, etc. Yeah! Ready made pastes can be a lifesaver on busy days. The Mie Goreng looks delicious! Hope you have been well, Bee. These readily available curry pastes comes to our rescue during those busy days. I will look out for this curry paste during my next visit to whole foods. That’s great. You should check out their site and make sure you go to the stores that carry the products. Pepy – I know, I can’t afford the time to make a complete version of mie goreng with acar, kerupok, etc. Hehe. love the presentation! I’m craving for a plate right now. I love using instant paste as well when I have no time to cook, which is actually most of the time;), I am glad that I am still on holiday at the moment…! Your mie goreng looks great! I just checked the website and Whole Foods was not listed as the store that carry their products in MA. There were only 2 stores that carry them and none of them close to where I live. Sad. Bee, where did you get the paste? All the Whole Foods store in CA listed on their site are in NorthCal. It’s not super spicy, it’s mild. Indonesian mie goreng is not supposed to be too spicy. Question about the yellow egg noodles: I’m more used to various rice noodle varieties, or fat udon noodles. The egg noodles only need to be rinsed, yes? Do you recommend a particular brand? Yes, it needs to be rinsed. I am not sure about the brand because I got mine fresh, and each location has different brannds. Hi!! I totally agree that instant paste are life savers and sometimes you really find good ones that are simply delicious and cut off hours from standing in the kitchen. I don’t think I have seen this brand. Will check it out next time. Thanks for the tip. I hope the book is getting along great! yowzers, I love mi goreng noodles but have never had them fresh before. I’m gonna make this asap! This looks amazing, so good. I live in Irvine, CA – I cant find this paste? where can I buy it? Nur – I think sometimes they carry it and sometimes they don’t. You can buy online at the link I provide in the post. The instant noodle pack is great, I love it, too. Indomie! Very tasty looking plate of mee goreng. 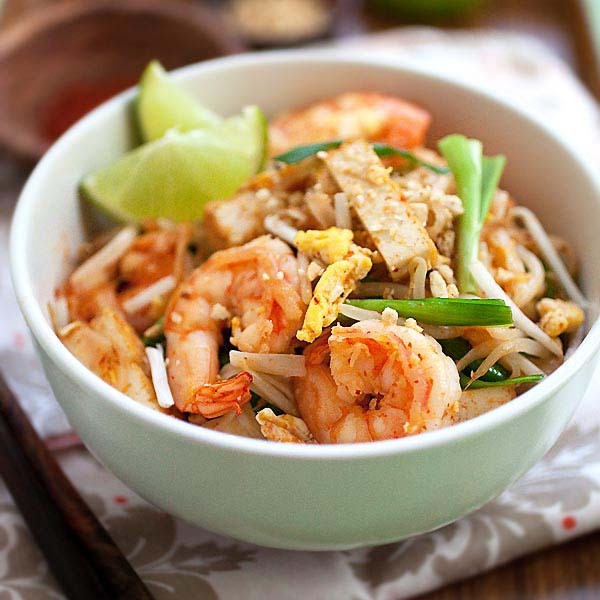 This inspires me to whip up a plate of Nyonya mee goreng, which is quite hard to find in Malaysia nowadays! My next post perhaps? Haha. *droolng* Thanks for the inspiration! Great blog, which I turn to every time I need to dig up an Asian recipe. Have to make some sambal from scratch, (the sambal one eats with nasi lemak,) is it already somewhere on your blog? Yes, just do a search for nasi lemak. The mee goreng looks delicious. Is the paste (made in Malaysia) available here, and where may I buy them. Thanks. Hi, I tried to look for the World Food paste in London,UK, but they don’t have any over here. Can you recommend other paste that I can use to replaced World Food paste? Hwei … you can find it at the Tesco stores under the specialty section. Hwei .. The paste is available at Tesco UK stores at the specialty ingredients aisle. Thanks May and mfoong! I will go look for it. This reminds me of Indomie, just that I prefer my noodles to be the wriggly, crinkled instant noodles-type. Not the alkaline yellow noodles. Bee, I need some help with noodles. I could not find yellow egg noodles in the vast selection of noodles (frozen or dry) in our Asian grocery store. What do they look like? Can you suggest a close substitute? Hello Bee, tried this for Sunday brunch yesterday. Couldn’t get the nasi goreng paste, substitued with sambal belacan paste (store bought) instead. Spicyness from the sambal belacan with a tinge of sweetness from the kecap manis makes this very delish! A must try for anyone! So authentic South East Asian flavour! I am not running out of ideas on what to cook these days. Thanks to your wonderful recipes! Cheers! I just checked the website and Whole Foods was not listed as the store that carry their products in MA. There were only 2 stores that carry them and none of them close to where I live. Top-notch share it is definitely. My girlfriend has been waiting for this update. i only have the nasi goreng sauce, and not the paste. how will i go about it? You can use the sauce to cook and adjust the seasonings according to your taste. thanks for the nice blog of yours… how i miss Malaysian food. although im a Filipino. I had been in Malaysia for 4 years and learn to eat Chinese, Indian and Malaysian cuisine.. i love mee sup and mee goreng mamak! This looks delicious! Unfortunately I live in Montreal, Canada and can’t seem to find the paste anywhere. Is there anything I can substitute it with or perhaps make it from scratch? Just returned from my first trip to Indonesia. Mie goreng was definitely a highlight! Thanks for the recipe. I can hardly wait to try it! I’m currently in the middle east and luckily the hotel has an incredible Indonesian restaurant serving Mie Goreng. I’ve been pestering the chef for the ingredients since I see him everyday around the hotel! If I get it, I might have to share it. Is that an error or what the 3 tablespoons under the, “1 lb yellow egg noodles, rinsed with cold water and drained”? Bee, I just made this tonight and it was SOOO GOOOOOD!!! Thank you for sharing. 20 minute effort, 5 star weeknight dinner. 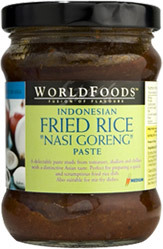 Question, I am in SF and my local Asian store has at least 5 brands of nasi goreng paste but not World Foods. Do you have a second favorite brand? If not, I will buy online. Thank you for the quick reply and for all that you do! i assume you mean 3 tbls of the paste? Thanks for pointing out. I didn’t even know that. Hi, it looks like it’s missing the recipe on this page. I made it a few weeks ago and it was so delicious and was a hit when I hosted a party at my house. I’m hosting a party again tomorrow (30 people), but I couldn’t find the recipe here anymore. If you have time, is it possible to post the recipe? Thank you!! Hi Alex, we are changing the page structure…the recipe is back, please check it out. Sorry for the trouble. Hi Lexi, the recipe is back, just click on Get Recipe.